You are here: Home / General / VOTE! Help Us Win Best Yoga Studio in WNC for Sixth Straight Year! VOTE! Help Us Win Best Yoga Studio in WNC for Sixth Straight Year! 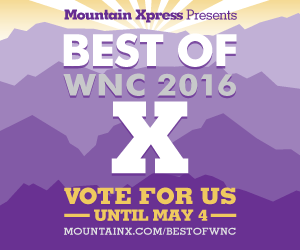 It’s that time of year again to cast your vote for the Mountain Xpress Best of Western North Carolina Readers’ Poll! We have won first place for Best Yoga Studio now for five years running, which puts us in the Hall of Fame. You can help us win for a sixth year! Voting for us as Best Yoga Studio is a great way to make a contribution to donation-based yoga without having to spend any money. You can also vote for our teachers as Best Yoga Instructor, and for Zen & Now as Best Used or Vintage Nonprofit Clothing Shop. Voting will take place now through midnight Wednesday, May 4. Click here to cast your vote now! The ballot requires you to vote for a minimum of 30 categories, so to help you easily fill out your ballot, we’ve compiled a list of 30 community partners who have supported the center with their time and resources. Please see below for the list of people who have supported us, who you can give back to with a vote in Best of WNC!